Hello and Happy GAY Pride my sisters!! Let’s talk about Stonewall, shall we? The bar in New York that sparked the LGB Civil Rights Movement! I saw this in my Tumblr feed this afternoon and it made my blood boil a bit because we lesbians have been fighting the re-written HIStory for several years now. 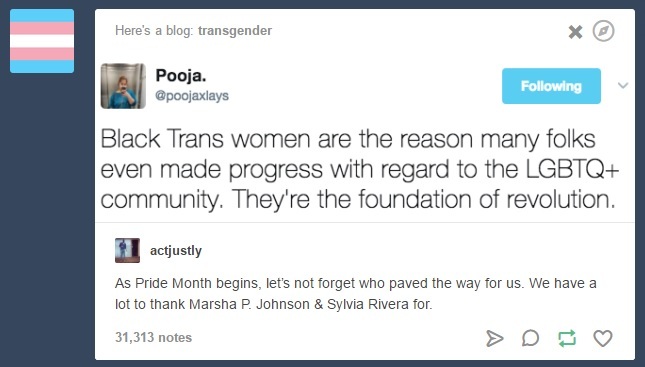 Ugh – Transgenders continuing the lie that they were the ones who started the riots at Stonewall, kicking off the Gay Liberation and LGB civil rights movement, when it was actually a butch lesbian woman (Stormé DeLarverie)* & a drag queen (Sylvia Rivera)**. Hell, you could almost say that the butch dyke started the whole thing because as she was being abused by the police & started fighting back, she engaged the crowd by asking if anyone was going to do anything. That’s when the crowd got into it with the police and a revolution started. In Rivera’s own words (interview below), he talks about it all happening around him; not that he started it all. We have to keep fighting against these lies or a whole new generation will believe them & pass them on, forgetting the actual truth, the actual history!! See, here’s the thing: transgenders want everyone to believe that the Gay Liberation and the LGB Civil Rights Movement was started by them and that we owe them our thanks. They have been peddling this lie for almost a decade and some – mostly youth, other transgenders, and libfem handmaidens – actually believe these #TransgenderAlternativeFacts. We have to deal with this every single year and it is tiresome; but as I said, we have to keep fighting, keep telling the truth, keep reminding everyone that is was not transgenders at Stonewall, it was a butch dyke and a drag queen. Share this information with the lesbian & gay youth, the straight people, and even the transgenders that you know. Spread the word so that these #TransgenderAlternativeFacts can become the memory, instead of the actual truth! This entry was posted in Uncategorized and tagged Butch, Butch Lesbian, Female, Gay Lesbian and Bisexual, Lesbian, Lesbian Erasure, Male, TERF, Trans, Trans woman, Transgender. ← Vlog Post 5: Lesbians Throwing Lesbians Under The Bus For Men. A Butch Dyke and drag queen started the StoneWall Revolution!!! Did anyone challenge the Tumblr post?